And so we come to another limited edition shirt on this list (yet again nominated by me), though this one encountered very little resistance due to its staggering beauty. 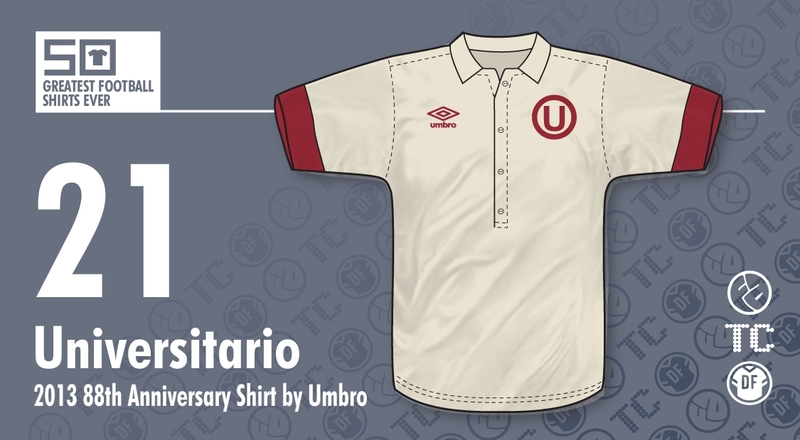 Released to celebrate Peruvian club Universitario's 88th year (oh come on, since when has that been any kind of event? 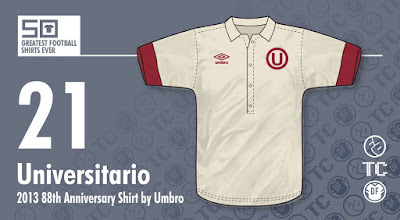 ), Umbro stripped things right back and went full-on retro. Despite being a very minimal design, there are several features that make this shirt great. Firstly, the whole thing is constructed from Umbro's lush cotton used on so many of their 'Tailored By' range. And then there's the details. Starting from the top, we find a neat, trimmed collar which then has a neck opening that extends almost all the way down to the abdomen; a brave move given how most manufacturers still try to keep their tribute shirts within the bounds of modern features. The club crest - a gorgeously simple U in a circle and rendered in maroon - is quite thick, luxuriously stitched on and again, really feels like it would have done in days gone by. The Umbro logo, rather than going with just the diamond (as they did for most of their 'Tailored By' range), has the company name underneath, akin to their '80s logo - a strange choice given the look they're clearly going for. Similarly, along the shoulders at the back of the shirt, is a maroon line extending from the neck, a superfluous detail that looks somewhat modern and therefore out of place. It's all very well going for a mix of modern and retro (a la Corinthians), but this only works when the shirt doesn't have its foot so heavily planted in one camp to begin with. Thankfully, these details don't detract too much from the overall look and to further enhance the shirt, the numbers are stitched on in contrasting thread. Finally, the sleeves are trimmed in thick cuffs and it's these details that truly make this shirt the work of art it is.